When speaking with GCSP course participants, alumni, and fellows, but also with friends and supporters from member states, we understand that effective 21st century peace and security policymaking necessitates thinking beyond traditional boundaries. And above all, it requires talented leaders who make a difference in advancing peace and security worldwide. and societies. We have done so successfully for the last 20 years, and looked back to past achievements during our 2015 anniversary celebrations. This report offers a snapshot of how we achieved results in 2015. 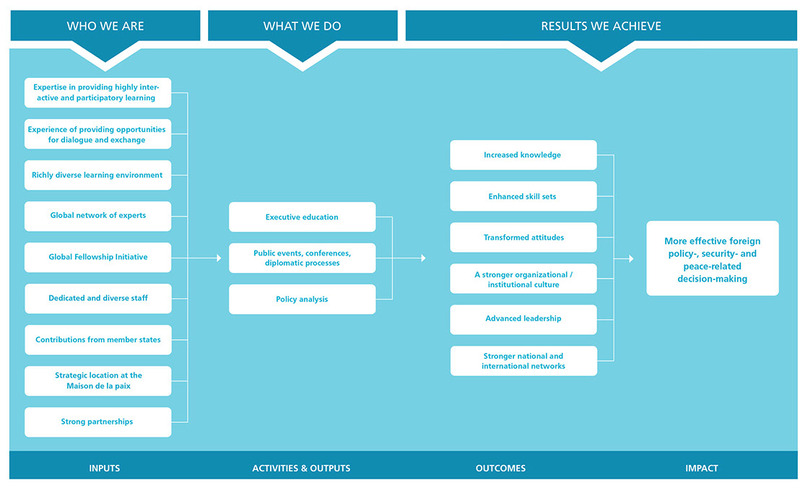 You will discover how we contributed to strengthening effective decision-making by developing talent, providing evidence for informed decision-making, and fostering exchange and dialogue. - Last year, we ran 14 new executive programmes, addressing issues such as foresight and strategic planning, new warfare and disruptive technologies, as well as creative diplomacy and security implications of climate change. - For the first time in GCSP’s history, an executive programme was held in Bangkok, extending GCSP’s reach to Southeast Asia. - We could also contribute to fostering strategic thinking in the field of cyber security, when hosting together with The Atlantic Council the first ever European Cyber 9/12 Student Challenge. - A new Alliance for Advancing Leadership in Peace and Security was launched in partnership with the Center for Creative Leadership. - Under the umbrella of its Creativity and Innovation Initiative, the GCSP together with high-caliber judges awarded the first GCSP Prize for Innovation in Global Security. - The Geneva Security Debates—a new Oxford-style debate series—was launched in October 2015. - Finally, the policy analysis publications have been revamped, allowing GCSP’s participants to keep up with current issues. I would like to seize this opportunity to thank our alumni, fellows, partners and staff for their continued commitment and support over the past year. I look forward to continuing to work with you in order to create lasting value and impact. The GCSP is an international foundation created 20 years ago at the initiative of the Swiss Confederation. What was to become the Geneva Centre for Security Policy had its roots in a training programme designed at the initiative of the Swiss Confederation to strengthen national expertise in the field of disarmament during the Cold War. While putting in place a nine-month executive course to train government officials in pertinent international security-related issues, the GCSP’s founding fathers were forced to look long and hard at what the focus of this course should be. It quickly turned out that there was a pressing need for comprehensive security training, not only in Switzerland, but also in many other European countries—and beyond. It was therefore only logical in 1995 to create a foundation at the initiative of the Swiss Government, with the support and guidance of an international Foundation Council. With Switzerland’s participation in the Partnership for Peace (PfP) a year later—an initiative led by the North Atlantic Treaty Organization (NATO) to enhance transatlantic security cooperation—and its affiliation with the Euro-Atlantic Partnership Council, in 1997 the groundwork was laid for the GCSP to become a valuable tool of Swiss foreign and security policy, or as the then-GCSP director, Ambassador Theodor Winkler, has put it “une place d’armes pour la paix”. Since its creation 20 years ago the GCSP has become a reputable institution delivering high-quality executive education programmes in international security policy, not only for participants in Switzerland and Europe, but also worldwide. 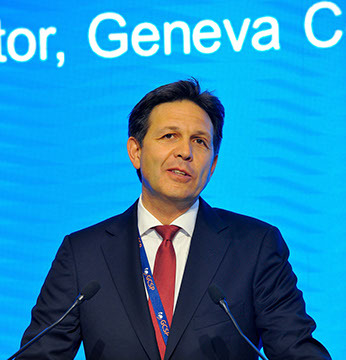 In addition, the GCSP has made its mark as an institution producing and disseminating policy-relevant ideas in specific issue areas, as well as a platform for dialogue and exchange in “International Geneva”. In a world where peace and security are constantly challenged by a rapidly changing ecosystem, the emergence of unexpected threats and constantly increasing tangled constellations, there has to be a change in the way organisations operate and make decisions. Navigating complexity and uncertainty requires courageous, creative and innovative leadership, based on resilience, foresight and versatility. The GCSP helps decision-makers update their knowledge base, hone their skills and reinvent themselves so that they can make change happen. We develop global leaders from a variety of professional backgrounds and geographical origins, promoting intellectual and cultural diversity, to encourage the exchange of different views and perspectives. The GCSP is proud to be one of Geneva’s Gender Champions, actively promoting diversity and gender equality. 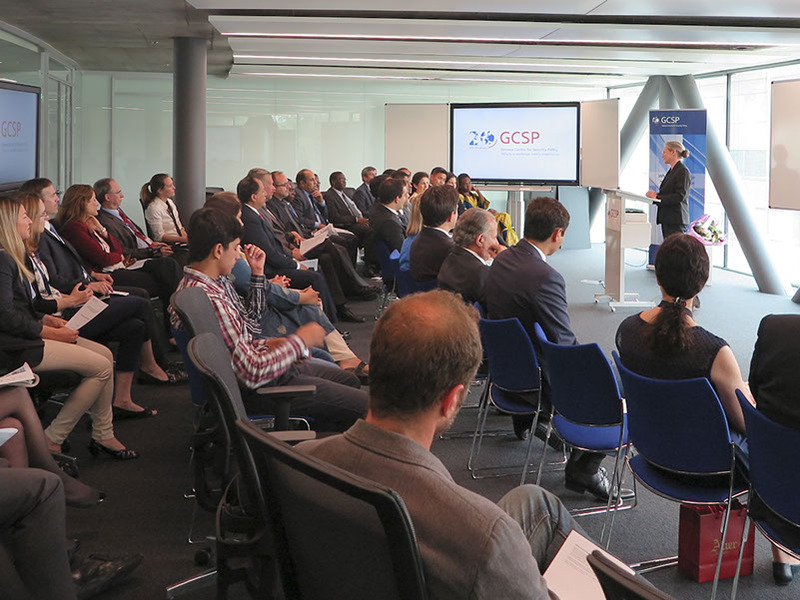 The GCSP offers a unique combination of knowledge and experience, and the space for building a collaborative global community of peace and security leaders. Leveraging our 20 years of experience, we adopt a comprehensive entrepreneurial approach that fosters the development of new ideas and fresh concepts to create lasting value and impact. We attract outstanding expert practitioners, renowned academics and first-rate facilitators. The GCSP’s highly interactive and participatory environment encourages knowledge co-creation in support of innovative solutions to peace and security challenges. In order to achieve an impact, the GCSP focuses on three specific lines of activity: delivering executive education programmes, generating policy-relevant ideas, and promoting dialogue and exchange. 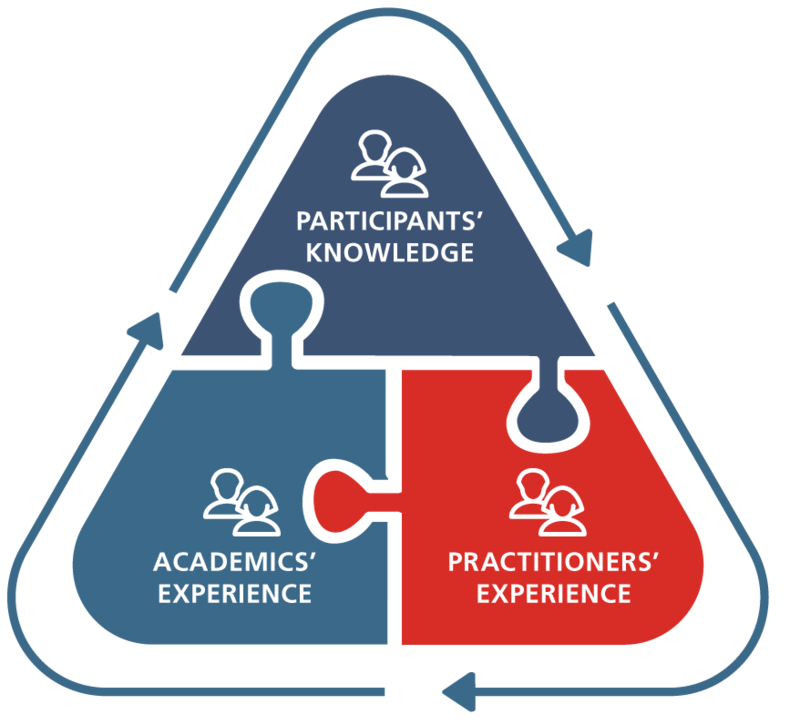 These three roles are closely intertwined and mutually reinforcing, but executive education is the organization’s main activity. Dealing with ambiguities and dilemmas, learning from failures, managing the complexity of international security policy—all these challenges require critical thinking, imagination, innovative problem-solving skills, and a solid knowledge of today’s multilayered security environment. Every year the GCSP trains some 800 national and international officials and executives designated for high-level positions from government, business, and civil society in pertinent fields of international security policy. The GCSP’s course directors and teaching staff attach great importance not only to enhancing participants’ understanding of a rapidly changing world, but also to fostering their interpersonal competences and skills necessary to untangle complexity and sustainably impact the decision-making processes in their respective organizations and countries. In 2015 the GCSP ran a total of 40 courses, including open-enrolment and tailor-made modules for partners in Geneva and abroad. Every year the GCSP trains some 800 national and international officials and executives designated for high-level positions from government, business, and civil society. We live in a highly interconnected world marked by ongoing, far-reaching transformations that are occurring both gradually and abruptly, on various levels, and in multiple spheres. Today’s security challenges are manifold, with intricate, interwoven, and interdependent patterns. The GCSP aims to contribute to a better understanding of the complexity of current global circumstances and to enhancing global responsiveness to future challenges through publications, public events, conferences, and expert comments in the media. The GCSP’s development and dissemination of policy-relevant ideas is also an important part of its success in delivering high-quality executive education programmes. The unique combination of the GCSP’s location; commitment to inclusiveness, impartiality, and independence; and professionally rich and geographically diverse expert base constitutes the foundation of the Centre’s recognized role as a platform for dialogue and exchange.